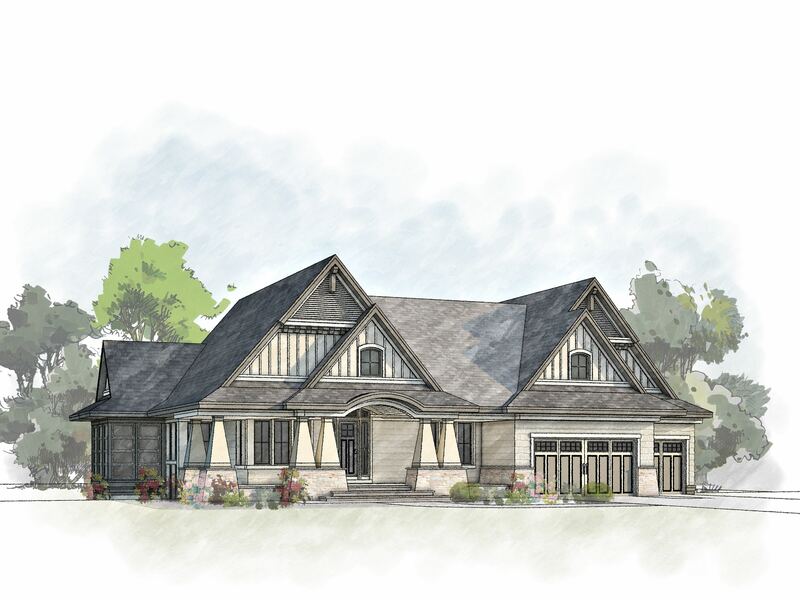 This four-bedroom, five-bathroom modern cottage sits on the golf course perimeter of The Royal Club, an Arnold Palmer and Annika Sorenstam designed championship golf course and luxury home community in Lake Elmo. Hartman Homes blends stunning craftsmanship with natural accents that reflect its beautiful surroundings. The great room showcases luxury living with a dramatic vaulted ceiling wrapped in shiplap and adorned with a multi-leveled, chandelier. The kitchen features more exquisite design with Cerused oak and painted cabinetry, Cambria counter tops, and an 11-foot-wide island. A grocery pass-through is located in the pantry for convenient unloading from the garage. The southward facing screen porch boasts a beautiful stone fireplace and Sunspace windows to protect from the elements. A bonus room and 3/4 bathroom provide additional space, accessible from a private staircase off the kitchen. In the walk-out lower level, a wine room, spacious family room, game room, wet bar, and sauna provide endless entertainment. Stone columns, wire-brushed shiplap, and unique wall-mounted pendant lighting give the pub a rustic edge. The home also includes a generous three-stall garage, as well as a tuck-under golf cart garage beneath the screen porch. The newly redesigned Royal Clubhouse, which is only a short drive from Woodbury, Stillwater, and downtown St. Paul, provides residents with various amenities, such as Arnie’s Restaurant & Bar, fire pits, and an outdoor deck overlooking the first and 10th holes. Future plans for the exclusive community include a private fitness center, swimming pool, a children’s park, and miles of scenic walking trails.